Friends, this post will be useful in personal interview if they ask about the recent happening in Indian defense. And it is usual to ask the latest news in Indian defense. 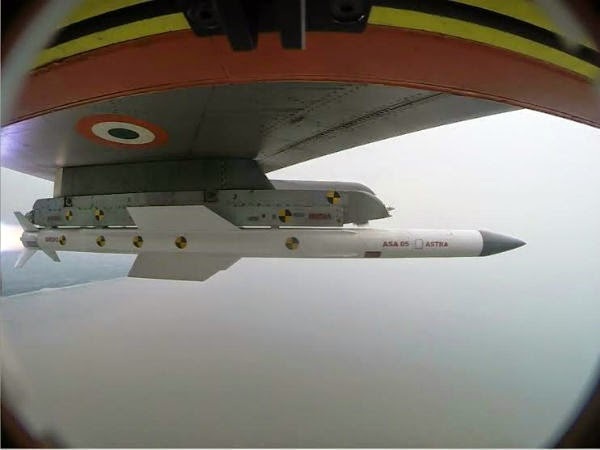 Recently, two days back Astra missle was successfully tested at Bhubaneshwar, Orissa. Astra is beyond-visual-range air-to-air missile (BVRAAM). It is developed by DRDO. The recent test were carried by Indian Air Force fighter air crafts. These tests were carried out from Sukhoi-30 MKI and its target was UAV - Un manned Aerial Vehicle. In future, it is going to be used in Tejas LCA. They can able to attack a target which is not visible even by normal eyes. They can able to attack short range target of 20 km to long range target of upto 80 km. Another major advantage is, it has smoke less propulsion system. It can able to intercept an aircraft which is coming even at Super Sonic Speed.